Visit our Little Sprouts PreK page. 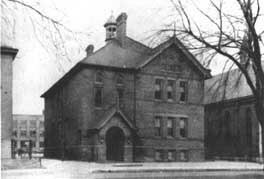 St. John’s Lutheran School has been serving the Two Rivers community since the mid 1800’s. It is owned and operated by St. John’s Lutheran Church as part of the congregation’s mission to “make disciples of all nations”. What makes St. John’s different from the public school and other private institutions is that each day, children from the congregation and community have the opportunity to study God’s Word. St. John’s Lutheran School assists parents in preparing children for Jesus for this life and the life to come. In September of 2016, St. John’s went through the accreditation process through WELSSA (Wisconsin Evangelical Lutheran Synod School Accreditation) which is formally recognized and approved by the National Council for Private School Accreditation (NCPSA). St. John’s students participate in a variety of academic, musical and athletic extra-curricular activities. St. John’s operates an all-day kindergarten and grades 1-8. St. John’s operates Little Sprouts PreK – a program for 3-year olds and 4-year olds. St. John’s is served by 6 full-time and part-time teachers. St. John’s has a 10 to 1 student/teacher ratio. St. John’s students are encouraged to continue their Christian education at Manitowoc Lutheran High School. “God our Savior wants all men to be saved and to come to the knowledge of the truth.” (1 Timothy 2:3-4) Therefore, St. John’s Lutheran School admits students of any race, color, national or ethnic origin to all the rights, privileges, programs, and activities generally accorded or made available to students at the school.